Posted by Richard Foote in 12c, CBO, Histograms, Oracle Indexes, Storing Dates As Numbers. In my last couple of posts, I’ve been discussing how storing date data in a character based column is a really really bad idea. In a follow-up question, I was asked if storing dates in NUMBER format was a better option. The answer is that it’s probably an improvement from storing dates as strings but it’s still a really really bad idea. Storing dates in DATE format is easily the best option as is storing any data in its native data type. In this post, I’ll highlight a few of the classic issues with storing dates in basic number format as well as showing you some of the calculations on the CBO cardinality estimates. So the ZIGGY_DATE column has 10,000 distinct dates (with 100 rows per distinct date), with a column density of 1/10000 = 0.0001. We see that all the data in the ZIGGY_DATE column are just number representations of dates, with a range between 10 Jan 1989 and 27 May 2016. Note there are actually 10,000 days between the dates but the CBO would estimate a range of 270,417 possible days (20160527 – 19890110 = 270,417). The CBO has no idea that the “numbers” within the column are all dates and that there are ranges of values in which data is relatively popular (e.g. between say 20160101 and 20160131) and ranges of values in which data is relatively unpopular (e.g. say between 20154242 and 20159999). Although not as bad as the range of possible unpopular values found within a character data type as I discussed previously when storing date data as a string, there is still enough data skew when storing dates as numbers to be problematic to the CBO. The CBO gets things spot on, correctly estimating 100 rows to be returned, as the CBO knows there are only 10,000 distinct values of which only one of those values is being selected. Selectivity is basically the density of the column = 1/10000 = 0.0001, so the estimated cardinality is 0.0001 x 1M rows = 100 rows. Perfect. The CBO has got things somewhat incorrect in this example and has underestimated the expect number of rows (573 rows vs. the 3,300 rows actually returned). The actual number of days between these dates is 33 so the actual ratio of data returned is 33/10000 x 1M rows = 3,300 rows. This is a range of “numbers” that overall covers a relatively “popular” range of date values. However Oracle is estimating a range of some 20151111 – 20151010 = 101 days between these dates. As the total range of possible days 20160527-19890110 = 270,417, the estimated ratio of returned rows is 101/270417 plus 2 x selectivity of a day for the implicit 2 equality conditions (as a between is effectively >= and <=). The selectivity of one day is just the density of the column, 0.0001 as illustrated in the previous query. Therefore, the query selectivity is derived as being (101/270417) + (2 x 0.0001) = 0.000573 when multiplied by 1M rows = 573 rows as estimated by the CBO. So the CBO is rather significantly *under* estimating the rows to be returned which could result in a sub-optimal execution plan (such as the inappropriate use of an index range scan as in this example, noting the poor clustering of the data). The actual number of days between these dates is only 8 so the actual ratio of data returned is 8/10000 x 1M rows = 800 rows. This is a range of “numbers” that overall covers a relatively “unpopular” range of date values. However Oracle is estimating a range of some 20160101 – 20151225 = 8876 days between these dates. As the total range of possible days is 20160527-19890110 = 270,417, the estimated ratio of returned rows is 8876/270417 plus 2 x the selectivity of a single day again for the 2 implicit equality conditions. Therefore, the query selectivity is derived as being (8876/270417) + (2 x 0.0001) = 0.033023 when multiplied by 1M rows = 33,023 rows as estimated by the CBO. So the CBO is rather significantly *over* estimating the rows to be returned which could again result in a sub-optimal execution plan (or the inappropriate use of a Full Table Scan in this example). The CBO is simply not picking up the fact that most of the possible values between the “number” ranges aren’t valid dates and can’t possibly exist. As the virtual column created for the function-based index also has 10,000 distinct values and a corresponding density of 0.0001, the CBO is getting the cardinality estimate of 100 rows spot on. But importantly, both associated range based queries are now also being accurately costed by the CBO as it now knows the data being searched is date based and hence can more accurately determine the actual expected dates to be returned within the specified “date” ranges. The CBO is now estimating not 573 rows, but 3,400 rows which is much closer to the actual 3,300 rows being returned. As a result, the CBO is now performing a more efficient Full Table Scan (due to the poor Clustering Factor of the index) than the Index Range Scan performed previously. The CBO is now estimating not 33023 rows, but 900 rows which is again much closer to the actual 800 rows being returned. As a result, the CBO is now performing a more efficient Index Range Scan than the Full Table Scan is was previously. Posted by Richard Foote in 12c, CBO, Function Based Indexes, Oracle Indexes, Storing Dates as Characters. In the previous post, I discussed how storing date values within a character data type is a really really bad idea and illustrated how the CBO can easily get its costings totally wrong as a result. A function-based date index helped the CBO get the correct costings and protect the integrity of the date data. During the demo, I re-collected statistics on the table as the associated hidden virtual column after creating the function-based index doesn’t have statistics. We can see that the hidden virtual column now has statistics. But we also notice another difference, that being the BOWIE_DATE column now has a histogram (of type Hybrid). As discussed in the previous post, the issue here is that the date data within the character column covers only a very specific subset of all the potential character values that could reside within the column. Therefore the CBO is getting the range scan selectivity hopelessly incorrect. Now that we’ve run a few queries featuring the BOWIE_DATE column in the predicates and as there’s effectively data skew within the column, the column becomes a candidate for a histogram with the default SIZE AUTO collection method. The histogram now provides the CBO with a much more accurate picture of the distribution of the data within the BOWIE_DATE and that between discrete “date” column values, there are only so many rows that qualify. As a result of the histogram, the CBO can now make much more accurate cardinality estimates. We see that at an estimated 4,152 rows, it’s a much better estimate. Not perfect, but maybe good enough to now get the more efficient Full Table Scan execution plan. We see that at an estimate of 572K rows, it’s now got this just about right and again has made the right decision with the Full Table Scan execution plan. Storing date data in character based columns is still a really really bad idea and limits the manner in which date data can be analysed, protected and accessed, but with appropriate histograms in place, at least the CBO has some chance of making a reasonable fist of things with some range based queries. As a follow-up, I was asked if storing dates in NUMBER format is a better option than as a string. I’ll discuss that next. Posted by Richard Foote in 11g, CBO, Clustering Factor, Index statistics, TABLE_CACHED_BLOCKS. In my previous post, I discussed how for larger tables that really do have randomised data, not even setting the new TABLE_CACHED_BLOCKS to its 255 maximum value is going to make any real difference to the resultant Clustering Factor (CF) of an index. The 255 maximum value here protects us somewhat from abusing this capability and setting unrealistic CF values. However, for smaller tables in particular, we do need to exercise some caution. We notice that at 22,711, the CF it’s pretty average. The table though is quite small at only 244 blocks. Indeed, we have improved the CF, dramatically reducing it down to just 240 from the previous 22711. Even though the column value for the CODE really is randomly distributed throughout the table, the CF now suggests the data is perfectly clustered. This is because with a table with only 244 blocks, incrementing the CF if the current index entry references a table block more than 255 blocks ago is now impossible. The CF is now guaranteed to be “perfect” as each index entry can only reference one of the 244 table blocks and so is incremented only when each table block is referenced the first time. The CBO is now using the index, but is now performing significantly more consistent gets, 681 rather than the previous 254. This execution plan is actually much less efficient than the previous FTS execution plan. The CBO is getting this wrong now as the CF isn’t really anywhere near as good as it’s now being lead to believe. Caution setting TABLE_CACHED_BLOCKS to a value that is anywhere close to the number of blocks in the table. This is one of the reasons for Oracle having a 1% of table blocks default value for this setting. Posted by Richard Foote in CBO, Clustering Factor, Oracle Indexes. 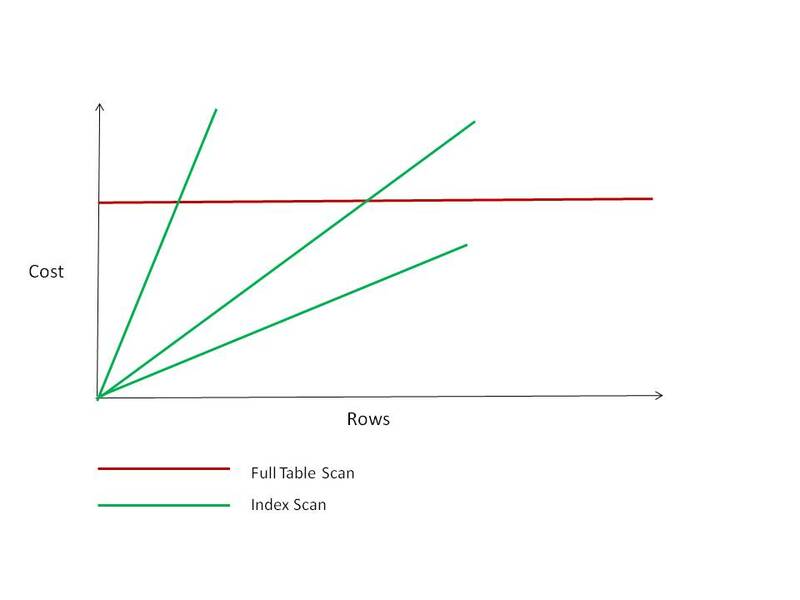 I’m in the process of writing a number of new presentations and in one I’ve included a favorite little graph of mine that I’ve used over the years to help illustrate the relationship between the cost of using an index vs. the cost of using a Full Table Scan (FTS). It’s occurred to me that I’ve never actually shared this graph on this blog, so I thought it about time I did. The Cost Based Optimizer (CBO) when choosing between an index scan and a FTS will simply go for the cheapest option. The more rows that are retrieved (or the greater the percentage of rows retrieved), the more expensive the index option as it needs to perform more logical I/Os. There will generally be a point when the selectivity of a query is such, that so many rows are retrieved, that the index costs will increase beyond those of the FTS and the FTS becomes the cheaper option. The cost of a FTS meanwhile is pretty well constant regardless of the number of rows retrieved. It needs to read all the blocks in the table, whatever the selectivity of the query. The red line represents the constant cost of the FTS. The green lines represents the cost of using various indexes, which increases as more rows are retrieved. The “steepness” of the green line and the subsequent increase in cost of the index as more rows are retrieved is due entirely to the Clustering Factor of the index. The steeper the line, the worse (higher) the Clustering Factor, the less efficient the index and the quicker we get to the point when the FTS becomes cheaper. The less steep the line, the better (lower) the Clustering Factor, the more efficient the index and the longer it takes for the FTS to become the cheaper option. In some rarer cases, the index might be so efficient (or the FTS so inefficient) that the index never reaches the point of the FTS and the CBO decides it’s overall cheaper for the index to potentially access 100% of all rows in a table rather than via a FTS. Posted by Richard Foote in CBO, Clustering Factor, Fake Indexes, Oracle Indexes, Virtual Indexes. I’ve previously discussed Virtual Indexes and how they can be used to do basic “what if” analysis if such an index really existed. However, a recent comment on the OTN forums regarding using them to compare index costs made me think a follow-up post regarding the dangers of Virtual Indexes might be warranted. To illustrate, a simple little demo. I begin by creating a table in which the data in the table is stored in CODE column order. An index on the CODE column would therefore have an excellent (very low) Clustering Factor. Note that the Clustering Factor is the most important index related statistic regarding the efficiency and potential cost of using the index. Oracle allows statistics to be collected on the table and associated Virtual Index (so that existing statistic gathering jobs won’t now fail), however without an associated segment, no statistics can actually be derived for the index itself. We note that the CBO uses a Full Table Scan as the CBO has no real choice here as Virtual Indexes are not considered by default. We notice a few interesting details. Firstly, the CBO has decided to use the Virtual Index however the number of consistent gets remains the same as the previous run so we can clearly see that behind the covers, the Full Table Scan is still performed. The index is not “really there” and so at execution time, the SQL statement is reparsed using the next best available plan. If we look at the execution plan costs, both the estimate row (10000) and byte values are spot on as these statistics are based on the underlining table/column statistics and the 100 distinct CODE values are evenly distributed. However, the index related costs look remarkably low. Just a cost of 1 to read the index and extract 10,000 index entries (that means an index entry is less than 1 byte in length on average !!). Just a cost of 9 to visit the table and read 10,000 rows. Even with the most efficient of physical indexes, these costings are not realistic and are based on highly questionable default metrics. Basically, the creation of this Virtual Column is telling us that there is no reason why the index couldn’t potentially be used, IF (that’s a big IF in case no-one noticed) the actual index related statistics are such that the CBO determines the index to be the cheaper option. But it depends on the actual characteristics of the index which can’t be accurately determined until it’s been physically created. As predicted, a Clustering Factor of 3546 on an index with 1M index entries is indeed nice and low. Indeed, the index has been used by the CBO. However, note that the costs are substantially higher (and more accurate) than previously suggested with the Virtual Index. Indeed the final cost of 60 is very close to the number of consistent gets (61) required by the execution plan and so suggests the CBO is making reasonable index based calculations here. We notice that both the execution plan and all the associated costs are identical to those of the previous example. So although the actual Clustering Factor of the index is likely to be dramatically greater here than it was in the previous example and so likely dramatically impact the costs associated with using this index, the Virtual Index is treated and costed identically. This is the simple consequence of not having the physical index structure by which to calculate the appropriate segment statistics. We can see that indeed the Clustering Factor is dramatically worse than before, increasing here from 3546 to 344700. We see the CBO has decided to perform the now cheaper Full Table Scan. Although the Virtual Index on this column was used, once the actual characteristics of the index are determined via the index statistics, the CBO has decided the actual physical index was just too expensive to use to retrieve the 1% of rows. The index is used but we can see why at a cost of 3483, the Full Table Scan at a cost of only 1005 was selected by the CBO. Virtual Indexes can be useful to quickly determine whether an index is a viable option if it were to be actually created. However, caution needs to be exercised if Virtual Indexes are used for cost comparison purposes and although Virtual Indexes might be used by the CBO, it might be another story entirely once the index is physically created and the actual index related statistics determined. Posted by Richard Foote in CBO, Oracle Indexes, Quiz. As many have identified, the first thing to point out is that the two queries are not exactly equivalent. The BETWEEN clause is equivalent to a ‘>= and <=’ predicate, whereas the original query only had a ‘> and <‘ predicate. The additional equal conditions at each end is significant. The selectivity of the original query is basically costed as (max condition – min condition)/(max column value – min column value). As this equates to 1 day/2000 days, the selectivity of the first query is therefore 0.0005. 1M rows multiplied by 0.0005 = 500 rows, the CBO cardinality estimate. Note that 0.0005 is also the selectivity of 1 day. The calculation for the BETWEEN clause is different. It’s the above formula PLUS the selectivity of 1 day for the each of the two equal conditions (as the CBO assumes you not only want the values within the range but the specific values on each side of the range). So that’s a selectivity of 0.0005 for the date range as above plus 2 x 0.0005 for each of the equal conditions = 0.0005 + 0.001 = 0.0015. 1M muliplied by 0.0015 = 1500, the CBO cardinality estimate of the second query. As many have mentioned in the comments, the Clustering Factor of this index is awful, as each of the distinct 500 occurences of each day is spread evenly throughout the whole table. It’s therefore very expensive to use this index to retrieve a “larger” number of rows. The cost of the first query that used the index is 505, about as bad as it gets when retrieving 500 rows. If we were to retrieve not 500 but 1500 rows, then the cost would effectively triple and be approximately 1500. However, the cost of the FTS as highlighted in the second query is 933. This is less than 1500 and so the FTS is prefered by the CBO in the second query. It all comes down to the relative costs and these all come down to the estimated selectivity of the query and the associated segment (and system) statistics, of which the Clustering Factor of the index is one of the most significant factors of all (no pun intended of course). If we effectively triple the estimated costs of a query as we do with the second query, then this can obviously have an impact on the CBO calculations and the resultant execution plan. then we now get the same FTS costings and execution plan. The moral of this story is that using a BETWEEN for a small range can significantly increase the cost of the query. Something to be aware of if perhaps close enough is good enough. I have a table that has 1M rows with dates that span 2000 days, all evenly distributed (so there are 500 rows per day for the mathematically challenged). All stats are 100% accurate and I have an index on the date column. Everything is perfect. The index is used and the cardinality estimate is spot on with the CBO correctly predicting that 500 rows will be returned. And now everything has gone wrong. I’m still getting the same 500 rows but the CBO is choosing an inefficient FTS. The estimates are now way way off, with the CBO expecting 1500, not 500 rows to be returned. QUESTION: Why has everything now gone so terribly wrong ? Posted by Richard Foote in ASSM, CBO, Clustering Factor, Oracle Indexes, Quiz. Indeed, the subtle but significant difference between the two demos was that demo one created the table in a tablespace called USER_DATA with manual segment space management (with freelists/freelist groups set to 1), while demo two created the table in a tablespace called USER_DATA1 with automatic segment space management. In the first demo, the 3 separate sessions all followed the same freelist and inserted their rows concurrently into the same table blocks, resulting in the table being effectively sorted in ID order. We notice the Clustering Factor of 2171 is relatively low for an index with 300000 rows, as indeed the order of the rows in the table almost exactly matches the order of the index entries. In the second demo, ASSM ensures the 3 separate transactions don’t cause contention and insert their rows in a different set of blocks from each other. This is good in that contention is reduced but has the nasty side-effect on now having the resultant rows scattered randomly between different sets of 3 varying blocks. The actual Clustering Factor isn’t particularly bad in that Oracle has to now visit 3 different blocks for a range of values that previously might have been co-located within the 1 block, but because of the manner of which the Clustering Factor is calculated and that it will increase even if forced to visit a block it had just visited a couple of I/O calls beforehand, the calculated Clustering Factor can be appalling. We notice the Clustering Factor is now terrible at 271936. It’s a classic example of a table with the data that is relatively well clustered but has an appalling Clustering Factor. If Oracle didn’t increment the Clustering Factor for a block it had only visited a couple of index entries previously, then it would likely have a similar Clustering Factor to the first demo. But statistics collection doesn’t take this into consideration, it will increment the Clustering Factor even if the block had only just recently been visited (only if it’s the same table block as the previous index entry will the Clustering Factor not increment during stats collection), so hence the terrible Clustering Factor and hence the dramatic difference in how the index is now considered, costed and used by the CBO. I then have 3 different sessions that run the procedure simultaneously (eg. exec add_bowie_rows). Oracle uses the index and all is well. It performs a FTS ??? Note, the cardinality estimate of 1002 is practically spot on and identical to previously when the index was used by the CBO. It still performs a FTS !! Will Oracle use the index. QUESTION: Why, what is the tiny little difference that has made such a huge difference in behaviour ?? ?